Rayford Steele and Cameron ?Buck? Williams find themselves pressed into service for the man they believe could be the Antichrist. Nicolae Carpathia takes over the United Nations, signs a peace treaty with Israel, and begins to lure the nations of earth together to form one global village. As believers band together following the Rapture, their peaceful world is destroyed again when global war erupts. A repackage of the New York Times best-selling second book in the Left Behind series. 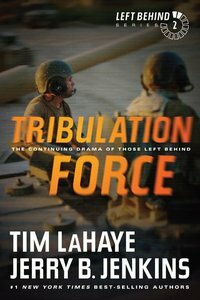 About "Tribulation Force (#02 in Left Behind Series)"